The silly season has come early this year – mistletoe has just been classified as a terrorist weapon… Or has it? I’ve covered mistletoe toxicity in this and previous blogs – as there really is a lot of nonsense about it out there that needs clarifying. If, as you read this, you’re sipping your mistletoe tea (popular in Germany, Switzerland and France, and available mail-order from TEME) don’t worry, it is NOT toxic, it just contains a few toxins. Which is not the same thing at all. But John Vidal reports in yesterday’s Guardian that mistletoe has been listed in the 2007 amendment to the Anti-terrorism, Crime and Security Act – and jokes (I think) that police could visit your house next Christmas to check security, and possibly confiscate and destroy your mistletoe. Can this be correct? Have the lunatics finally taken over? Well, yes and no. Mistletoe itself hasn’t been added to Schedule 5 of the Anti-terrorism, Crime and Security Act – it is just Viscumin, a lectin (aka Mistletoe Lectin 1 or ML1) that has been added to the banned list, in the toxins category. So what is Viscumin and why is it dangerous? Well, in concentrated form it has similar ribosome-inactivating effects to Ricin, a lectin from the Castor Oil Plant. Ricin (also listed in the Act) can be deadly, as shown by the death of Georgi Markov in 1978, but it seems an unlikely weapon of mass destruction, despite occasional scare stories in the press. Viscumin seems even less likely, as it is 30 times less effective than Ricin, and, unlike Ricin, the source material is not readily available as a conventional crop. So I rather doubt police will be raiding homes hanging mistletoe next Christmas – but we must all become much more vigilant against balaclava-wearing mistletoe rustlers, perhaps soon to be seen up a tree near you…. 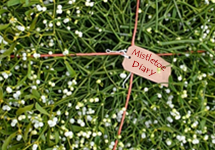 Mistletoe Matters Consultancy promotion progresses, and suddenly the ‘Mistletoe Matters’ discussion group suddenly flares unseasonably into life – 2 new posts from 2 new members at once. One is Rod Chapman, a mistletoe enthusiast from Norfolk – he’s been out and about finding unusual hosts, including Cotoneaster and, remarkably, a Lonicera (honeysuckle). More on this here. This is a newly imported blog from Typepad – formatting not yet complete… Come back soon!